The wait is finally over. After a nail biting 7 episodes we now know who has won Wilson Golf’s Driver vs. Driver 2 Show. On Wednesday night, Evan Hoffman’s Cortex Driver, came out on top, winning the San Diego native a cool $250,000 payday. At the centre of the Cortex’s innovative design, is Fast Cage Technology. Over 44 percent of the head of the club has been replaced with a lightweight carbon fibre, leaving a rigid titanium skeleton that provides structural stability and precise weight distribution, for the ultimate in adjustability. Fast Cage puts the weight where you want it, allowing you to maximise distance and optimise spin. Discretionary weight, saved from the crown and head, was then used to make Wilson’s longest-ever sliding weight track. By moving the 8-gram weight towards the face, you can adjust the centre of gravity for a low launching ball flight, with maximum fairway rollout. Whilst moving the weight towards the rear of the driver, will create higher ball flights and maximise carry. The Cortex comes standard with the 8-gram weight near the toe, and a 2-gram weight near the heel. These provide a neutral distribution of weight, and are interchangeable to promote a neutral, draw or fade bias off the tee. For the ultimate trajectory control, Wilson have fitted the Cortex with their patented Fast Fit Technology hosel system. This gives golfers an incredible six adjustable options to fine tune the loft of the driver in half-degree increments. Making this the brand’s most adjustable driver. 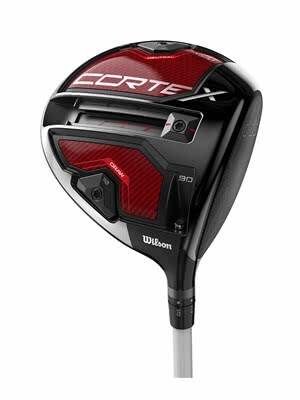 Buy the Wilson Staff Cortex Driver now at GolfOnline.